The provisional count of births in the United States for 2010 (12-month period ending December 2010) was 4,007,000. This count was 3 percent less than the number of births in 2009 (4,131,019) and 7 percent less than the all-time high of 4,316,233 births in 2007. The provisional fertility rate for 2010 was 64.7 births per 1,000 women aged 15–44. 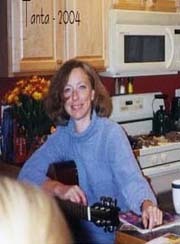 This was 3 percent less than the 2009 preliminary rate of 66.7 and 7 percent less than the 17-year high of 69.5 in 2007. Births have declined for three consecutive years, and are now 7% below the peak in 2007. I suspect certain segments of the population were under stress before the recession started - like construction workers - and even more families were in distress in 2008 through 2011. Of course it takes 9 months to have a baby, so families in distress in 2010 probably put off having babies in 2011 too. 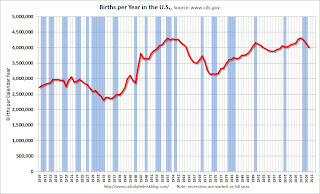 Notice that the number of births started declining a number of years before the Great Depression started. Many families in the 1920s were under severe stress long before the economy collapsed. By 1933 births were down by almost 23% from the early '20s levels. Of course economic distress isn't the only reason births decline - look at the huge decline following the baby boom that was driven by demographics. But it is not surprising that the number of births slow or decline during tough economic times - and that appears to be happening now. 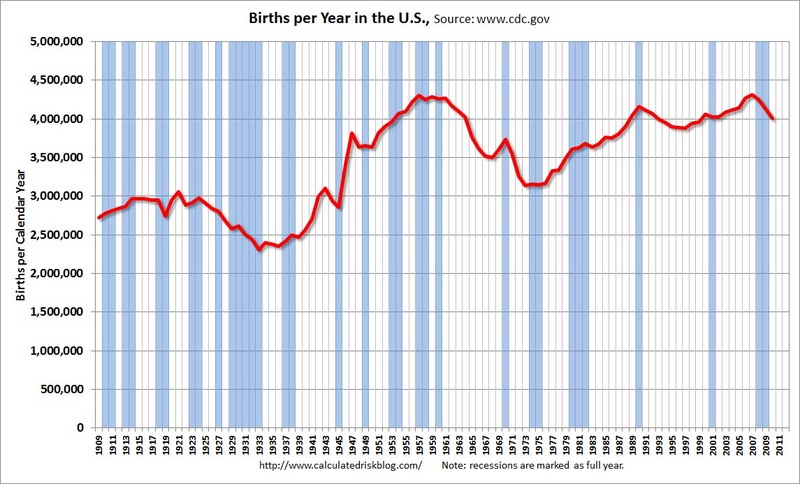 I don't think the percentage decline in births will be anything like what happened during the Depression, but a 7% decline is pretty significant.